8 Finalists: Vote For The Winner! 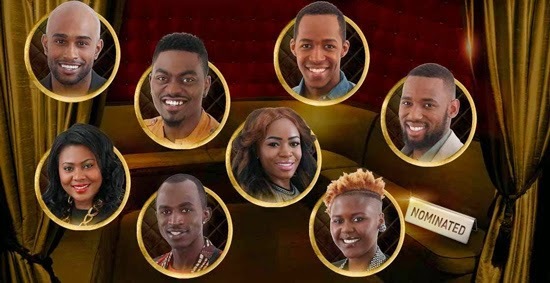 Big Brother Hotshots has come down to this: eight Hotshots all vying for the ultimate prize of USD300,000. IK played a joke on the housemates, saying that he had more bad news. But it was obviously not the case as there are eight Hotshots in the final week. One of Butterphly, Idris, JJ, Macky2, M'am Bea, Nhlanhla, Sipe and Tayo will be crowned as the Big Brother Hotshot on Sunday, December 7, in the explosive finale. IK told the housemates in the house that as a reward for making it to the final week, Big Brother had arranged a special treat for making it to the final week. A concert featuring Addiction, Dee Moneey and Tekno. As soon as the eviction show ended, voting opened and it closes on Sunday at 06:00 CAT. Remember, this is important, you are voting for the person you want to win. This week, Africa will be voting for who they think should win, not who they want to leave the house. The housemate with the most votes at the end of this final week, will be the winner. Sunday's show starts an hour earlier, as it is a two hour special, from 19:00 until 21:00. Who do you think will win, who is the ultimate Hotshot? Pls lets not only comnent here but vote for Tayo the ultimate hotshot! Mozambique and Uganda please vote Tayo, he has been true to your reps Trezega and Esther small pepper, he deserves it more than Idris who uses people to play his game like he used ellah. Thank u Rwanda, you guyz rock! !,Mozambique and Uganda we humbly ask for your support for Tayo! He is a golden heart. It certainly shouldn't be about regions or else the entire purpose of big brother would be defeated. tank u Africa!!! tank u Rwanda!! tank u Frankie!!! tank u our neighbors Ghana n tank u rest of Africa,!! naija loves u all!! tanks Frankie!!!!!! u r a real fwnd naija loves u Frankie!!!!!! why do you hate macky2? just because he is cool and quiet, thats his personality. Team Tayo, u didnt support Frankie, neither did u support Kacey moore, hope uve learnt athing or 2 about loyalties.All the best Tayo. Idris has shown more maturity than most housemates. Kacey Moore attacked him unnecessarily but he handled well, he has been cool about each housemate! About the Goitse and Ella issue he was just confused, like anyone of us can be at times! He is just human and real! So please people vote for Idris, he is just a humble guy!! Thank u zambia for voting sipe. hope mozambique will help sipe as well. sipe deserves to win. I am disgusted with South Africans who vote for Tayo instead of BOTS. Where is your loyalty. Nigeria will never vote for any South African. How can u disrespect your country like that. And now you have Nhlanhla in the final instead of supporting him/supporting YOUR COUNTRY what do u do. WAKE UP SA AND SMELL THE COFFEE. Gosshhh talk about confused people. Me too. I am an South African who voted for both Goitsr and Sheillah I think SA votes had been dupped. We have been robbed something is not right here. We all know that SA voted for BOTS. Uganda ain't voting 4 n one. Keep ur battles to urslfz. As for Rwanda. No comments. u wish...ddnt u chuz ur side chick over our galz? Wats wrong wit Rwandas?we voted Frankie as east Africans why can't u just do the same rather u vote goitse n tayo!like seriously guys?????? GIANT of Africa (Nigeria) we don't need ur smelly support (Botswana & other SADC members). We have togo, Sierra Leone, Liberia, Senegal, Tunisia, Cameroon, Rwanda & Rest of Africa (8 votes) vs idris (3), Nhlanhla (2),sipe (1),jj (1), buterphly(0),mambea (1),macky2(1). Ellah wants Nhlanhla 2 win so plz bots,moz,nambia and all SADC let's vote 4 our home boy and tayo fans said tayo already won so there's n0 need 4 us 2 v0te 4 him ryt??? STOP DISGUISING URSEF DAT U ARE A NIGERIAN. PPL WRITE BAD COMMENTS JUST TO SPOIL NIGERIAN REPUTATION. Ha ha Ha Nigeria what is wrong u guys? If u don't want our support Zen keep quiet. Team idris lets do it for our boy. The guy is way too smart for his age. Tayo is just too arrogant. If he gets the money he wont even use it wisely. Stop poisoning people's mind, vote who so ever u think deserves it. REAL TEAMSA for SADC ONLY. Nhlanhla. JJ. Butty. M2. ONLY!!;;!!! Are u people God, nawa o, because they decided to do the right thing by not voting evil idris.. they guy can pretend, I just feel sorry for ellah. All over the world for fluads, drugs, stealing and all sorts of Bad things Nigéria Is caused!! Thats y calamité,s Is always happening in nigeria sodom and gomora vert soin God ll wipe That dirty country. Now its clear SA votes were rigged. It's okay BOTS u can vote for whomever u want to vote foe we. SA we are fine with that. Nigeria will win this with ya held. Even though they made it clear that they don't need yo votes. But I wonder since they say they"ve already WON why does AFRICA bother. all those saying nigeria did not need other africa vote is hiding under the pretence of been tayo fans.pls Africa pls vote wisely becos nigerians are not ungrateful.thank you all for voting tayo. vote for ur favourite house mate africa dont look at people comment vote by following your heart. Vote without sentiments.vote tayo the real deal.tayo was one person that never gossiped about other country reps in the house.he deserves all african country votes.shame on zambians voting for macky2.a mean person that stays like a statue all day long?idris is a fake person toying with people's emotion pretending to care he is evil I see through him.nhlanla is a fool who doesn't know his left from right he can't be a winner.tayo or mambea for the money.forget south east or west africa.vote for the best candidate,vote for the best personality tayo has it.thank u rwanda rest of africa,mozambique,uganda,namibia,botswana,tayo was true to ur reps vote tayo! Vote tayo! Nigeria we r not shaken with such peanut 300USD. Our Dangote can give triple as much to Tayo from his pocket. Poor starving SADC ( BOTSWANA, namibia) u pole r lazy&easy-going especially women with no respect to men (refer Samantha, sheilla, Miss P etc.). Now I understand why half of ur population is HIV POSITIVE. Im a Nigerian but this your comment is very foolish..
He/she does,nt even know That his mother Is also hiv positive foolish indeed. Nigeria voted for Sheilla and Goitse when they were up separately. bots is voting TAYO.....Icn take all the insults by Niigeria dsnt hurt as much as wen SA was attacking GOITSE...i dnt care about Naija so even if ey insult it doesnt hurt...so we team Goitse are voting TAYO!!! Deal with it!...Naija...humility doesnt kill! Bots u can vote for whomever u want to vote for. It is okay there is no beef here we South Africans are okay with that we don't force people to vote for us. We voted Sheila and Goitse out of the good of our loyalty and love between these two countries. Nigeria voted for Sheilla and Goitse when they were each up separately. Botswana should vote Tayo please. Tayo appreciate all Africans, and please ignore the comment of saboteur who are acting naija to spoil game for Tayo but their evil plans will not work IJMN. king Tayo deserve the money we have seen him in ramifications in the house, he is real and a hotshot. I so wish all these cments cn be counted as a vote,bt No. So pple use ur time wisely nd vote stp insulting 1 another.